A truly posh establishment is often financially out-of-reach for many unless they’ve planned it out carefully, and additionally, most places like that don’t exactly encourage loud talking or laughing, which is, of course, what helps many de-stress after a long hard day at work. You and your friends want a comfy place where you can relax, let your hair down and be your true selves, however raucous and joyful you are, right? Why not try Brazilian Gourmet? Why Brazilian Gourmet, and Where Is It? If you’ve never been to Brazilian Gourmet before, it’s located in the Fitzrovia area, at 70 Cleveland Street. To get your bearings better, notable ‘landmarks’ that are within walking distance are the Grant Museum of Zoology, University College, Park Square West (part of Regent’s Park), YHA London Central, and Fitzroy Square Garden, to name a few places. To get here via Tube, the two closest stations are Great Portland Street and Warren Street. Depending on where you live or work, you could also come up via the Goodge Street Station, turning left on Tottenham Street, then a right onto Cleveland Street for a healthy walk to work up an appetite. 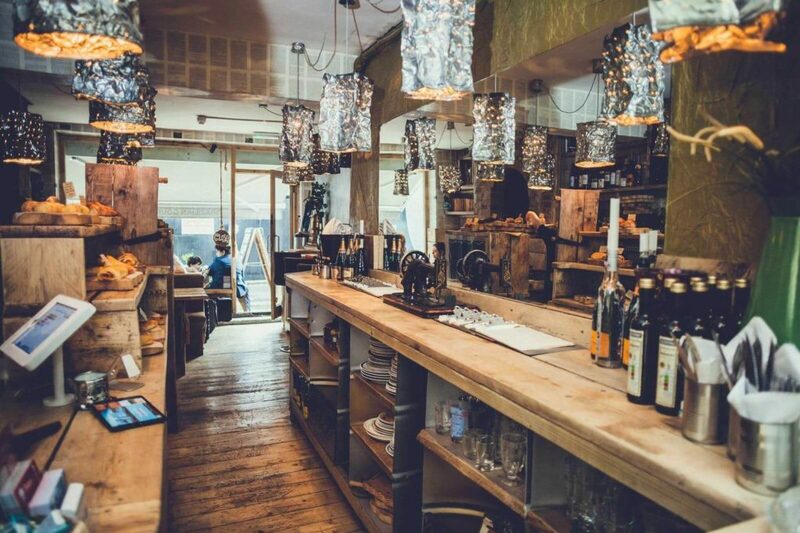 Once you walk in, you’ll be greeted by a cosy, rustic atmosphere, with wooden tables and metal lamp shades, some of which even resemble food graters and colanders. But those aren’t the only things that make this restaurant a place for a great night out, filled with conversation pieces that are made for having a nice chat. Throughout the restaurant, there are old-school-looking items such as an old Singer sewing machine, metal tricycle sculptures that also serve as napkin or wine holders, and even an old guitar. Around the room, you’ll also find a rather charming item that would belong in any quintessentially cosy restaurant: wine bottles that serve as candle holders for long taper candles, and yes, those candles are sometimes lit. But what truly makes Brazilian Gourmet a good environment for a friendly meet-up, especially for literary and music-loving types, are the many books on bookshelves throughout the room, and the Brazilian music playing in the background. You might hear a jazzy piece, or perhaps a bossa nova or samba, but whatever’s playing, the music does its part to weave a spell of contentment over those who come in for a bite. As for the books, you can either read them there in the restaurant, or if you love what you’re reading, but have to rush out for whatever reason, you can purchase it for a reasonable price and take it home with you to finish at your leisure. When Can My Friends and I Meet? Brazilian Gourmet is open for breakfast, lunch and dinner, with the restaurant closing at 22:30 (10.30 PM). This place has truly become quite popular, so it’s always helpful to book a table ahead of time, so you and your friends know precisely when to arrive. You might think, though, that because bookings are essential, Brazilian Gourmet’s prices are steep. This is not necessarily the case. The food is quite affordable, so you could come here perhaps once or twice a week and not completely wipe out your entertainment budget. With the holiday season upon us full force, and the last two weeks before Christmas are flying by, it’s always good for friends to get together, decompress from the rush and blow off steam with good conversation, a cosy atmosphere and above all, delicious food. Next post What’s Acai? And What Are Its Benefits?